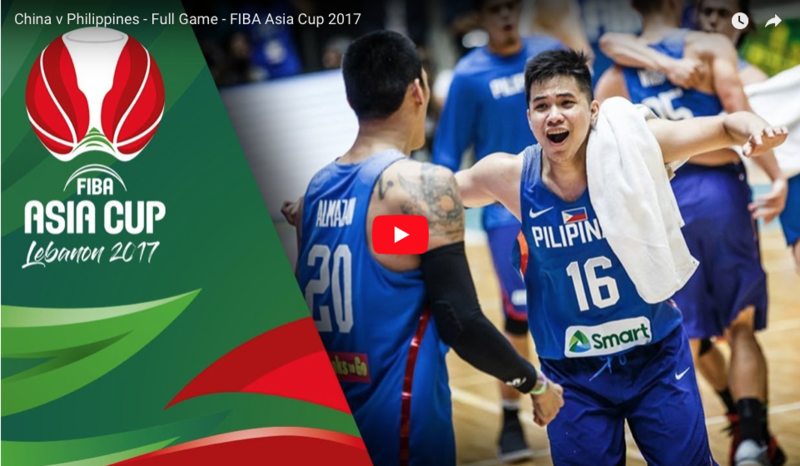 3 RP games from Fiba Asia Cup play – SAMAHANG BASKETBOL NG PILIPINAS INC.
Fiba listed three matches by the Philippines from Fiba Asia play in its regular releases. Here’s looking back at them. This was only the first game of the tournament for both teams, so there were a lot of uncertainties as to how much this game actually meant at the time. Nonetheless, any game between the Philippines and China in basketball should always be pegged as a must-watch. The Philippines led for most of the game, powered by the brilliance of Terrence Romeo who finished with 26 points and 5 three-pointers, but China refused to let up. Even though they were down 80-70 in the 4th quarter, it took only a couple of minutes for them to fire back with a 13-2 run (7 points coming from Guo Ailun) to overtake the lead for the first time in the entire game. Romeo countered with a knockout punch of 8 straight points in the final 4 minutes for the Philippines to finish the game on a 12-0 run en route the win. The Philippines eventually went all the way to win second place at the FIBA Asia Cup 2015, but this game against Palestine was probably not how they envisioned their first match of the tournament. A free throw from Calvin Abueva put the Philippines up by a relatively comfortable 71-62 lead with less than 5 minutes to go in the game. From there the score froze for nearly two minutes. Then Sani Sakakini scored two points. Imad Qahwash followed with another two points. After that, just under the two-minute mark, Jamal Abu Shamala dropped a transition three to close the game to within two points. A few seconds later, Abu Shamala said “Oops, I did it again” and nailed another transition triple to give Palestine their first lead since the first quarter. Andrey Blatche responded with a basket to get back into the lead and end Palestines’ 10-0 run, but it was all for naught when Qahwash dropped a beautiful bounce pass to Sakakini to seal the deal in the following play. Korea has consistently been a thorn in the Philippines’ sides up to a point where the “Korean Curse” is a legit term among the Gilas faithful. They had endured heartbreak after heartbreak to the Korean sharpshooters, but that just wouldn’t be the case here at the FIBA Asia Cup 2013 in Manila. The game was never fully in favor of any team and no one gathered a lead larger than single digits. The Philippines had gathere momentum on their homecourt in the 4th quarter, but it seemed as though the “Korean Curse” was ready to take over when Kim Tae-Sool knocked down a smooth jumper to give his team a 77-76 lead with less than three minutes left. The Philippines’ forward Ranidel De Ocampo decided to challenge the powers of the so-called curse and scored 5 straight points on a driving right-handed layup before adding in a deafening three-pointer to give the Philippines the lead for good as well as the win. The victory was not only significant for it being the one for the Philippines over Korea, but also because it safely secured the Philippines their first FIBA Basketball World Cup bid in 36 years. Who will be the SBP U16 3×3 National Champion?